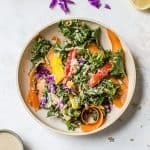 This Rainbow Kale Quinoa Salad is loaded with carrots, red cabbage, bell peppers and tossed with a creamy ginger dressing – This recipe is nut-free, has no added sugars, vegan, and gluten-free. Recipe originally published in 2017. Photos updated 2019 – Same delicious recipe! 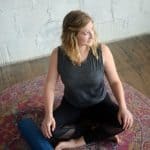 I’ve been thinking a lot lately – about how my outlook on wellness has completely shifted over the past few years, and what living a healthy lifestyle really means. From worrying about every ingredient that went into my body to finding peace with food and letting go of the control. I finally feel like I am in a place where I actually understand the meaning of balance, or at least what balance looks like to me. As I was preparing the red cabbage for this kale quinoa salad, I was snacking on some pieces. And it brought me back to three or four years ago, when I went on a beach trip with some girlfriends. Leading up to the trip I remember worrying about what I would eat while we were there. I worried about whether or not I would drink alcohol (extra calories). I was also afraid I wouldn’t be able to find anything remotely healthy, so I brought a lot of my own snacks. I brought some go-t0 healthy snacks like energy balls, carrots, hummus… and then a ziplock bag of raw red cabbage. Who brings a bag of red cabbage to the beach. Who does that? Unless you actually do because you truly REALLY enjoy it… But that was not the case here. I distinctly remember packing that bag of cabbage strips, telling myself, “This will be a good snack.” I snacked on those cabbage strips and told myself I was being healthy. That I was basically a better person for choosing to snack on cabbage instead of grabbing something (much less healthy but way more delicious) from the hotel bar. I still have this picture of my friend and I from that trip. I look at it and think “Wow, I was quite thin then…” But in my mind I was no where near where I thought I “should” be. That was probably the year I was also getting comments from close friends and family that I was getting “really skinny” but brushed them off because I didn’t feel like I looked any different. I was just eating healthier and working out was all. It’s weird how our mind works, isn’t it? But back then I was worrying about everything from how much food I ate, what kind of food I ate, and how much I got to exercise in a week. I wasn’t really living much because all of my spare thoughts revolved around food and exercise. When I look at that picture of myself I can see how much my body has changed – I take up more space, but I’m much stronger. It’s a weird feeling to look back on that photo. And then to see more current photos of myself and how different I look. I’m not sure if it it’s that I am getting older or if I have finally found a better sense of confidence in myself, but honestly? I just don’t GAF what my body looks like in photos anymore. That’s not to say I don’t second guess it sometimes. But overall when I look in the mirror I feel pretty damn good. And when I see a photo of myself with a less than flattering angle, I look at it for a split second and then just brush it off and move on with my thoughts. Because I remind myself of how strong and healthy I feel. And there is SO much more to life than working out tirelessly and restricting your diet for smaller legs, arms, a six pack – whatever it may you’re trying to achieve. That “smaller is better” mentality has to go. 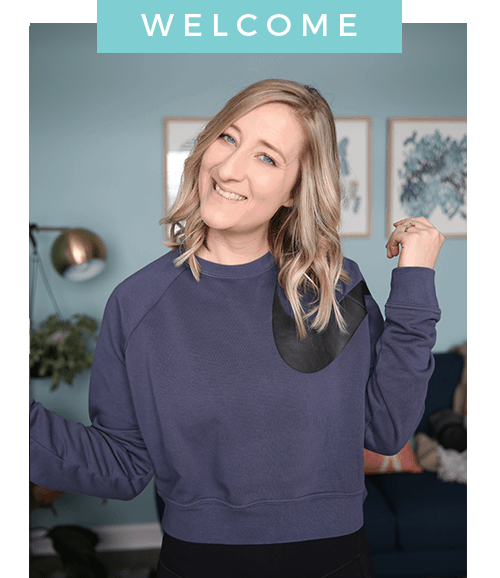 That is not to say I don’t think you can’t work for aesthetic goals… but when there is an underlying obsession with food and exercise, and actually living a happy life gets “in the way” of your goals, maybe it’s time to reassess your goals? I’m not here to tell you what to do, of course. Just sharing my experience and thoughts on a subject I am sure so many of you can relate to. But all in all, everyone is different and has their own way of living their life. Just remember to think about HOW you want to live. Finding freedom around food and learning to love your body is a wonderful thing. This kale quinoa salad is definitely a new favorite of mine. Perfect for large gatherings! How long does this recipe take? About 30 minutes to put together, including the quinoa cooking time. Prep your vegetables and dressing while the quinoa cooks and cools, then toss everything together in a large bowl. Can it be made ahead? YES. The flavors actually settle in quite well after a day or two. This makes for a great meal prep salad. The salad could be prepped a day or two in advance, just toss with the dressing before serving and you’re good to go! 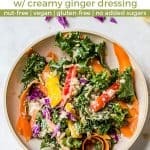 How do you make the dressing? I use my nutribullet to help process down the minced garlic and fresh ginger. If you don’t have a food processor or small blender, you can use ground ginger and garlic powder – the flavors won’t be as prominent though. Can I leave out the quinoa or sub another grain? Absolutely. 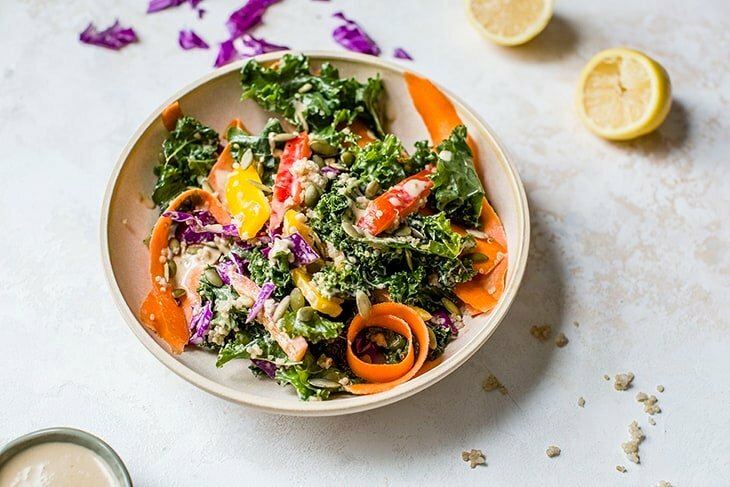 Omitting the quinoa will leave you with a good ole kale salad (that happens to be Whole30® compliant). Or if you prefer farro, rice or freekeh, those work too. Can I use spinach instead of kale? 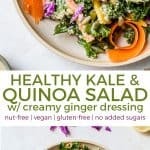 I don’t recommend it in this recipe as the dressing and rest of the ingredients are heavier, and the kale is study enough to soak up the dressing while not getting soggy. If you make this recipe, leave a comment and review here on the blog – I love hearing from you and it helps others find the recipe too. Enjoy! Rinse quinoa in fine mesh strainer and place in small pot of water with 1½ cups of water. Allow pot to come to a boil. Simmer for about 15 minutes, until quinoa is tender and water has mostly gone. Remove from heat and gently fluff with fork before transferring to heat-proof bowl to cool. While the quinoa is cooking and cooling, prep all of your veggies. 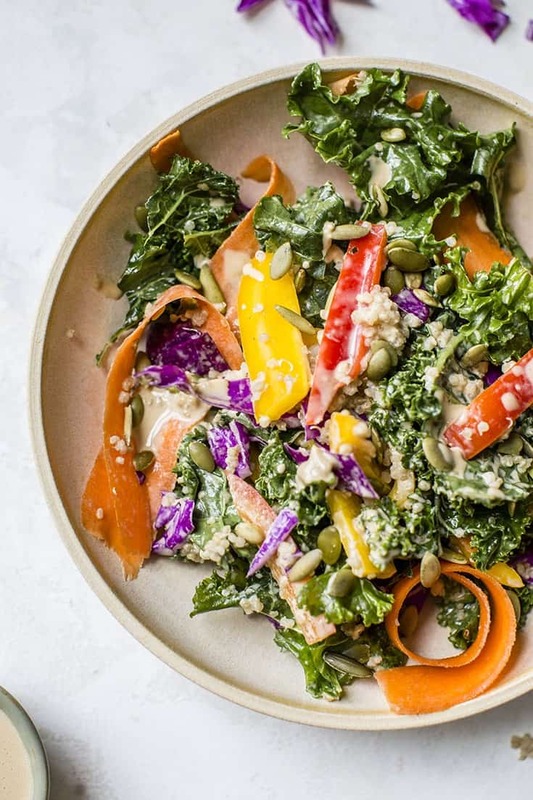 Place chopped kale in large bowl and drizzle oil over kale. Gently massage oil into kale with your fingertips to soften the kale. This will help take the bitterness away as well. 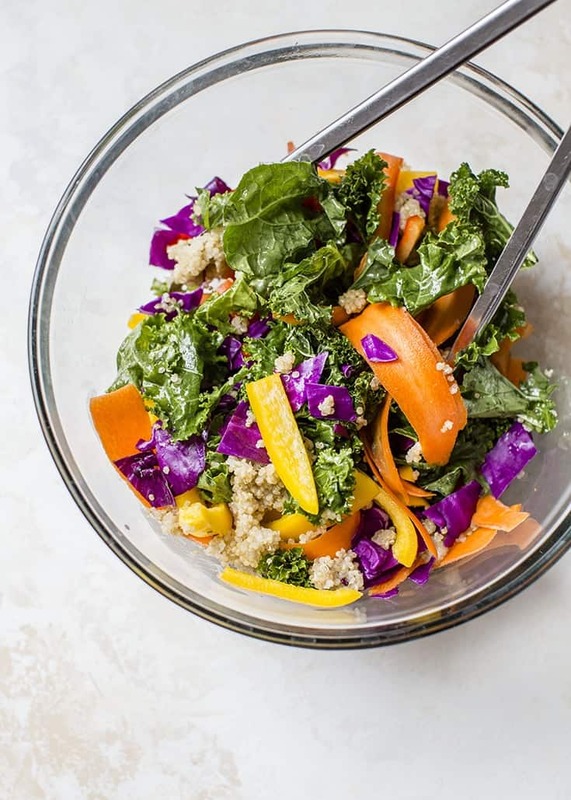 Add in the rest of your prepped veggies – red cabbage, carrots and bell peppers – with the kale. Once quinoa has cooled, transfer to large bowl of kale and veggies and use tongs to gently toss. 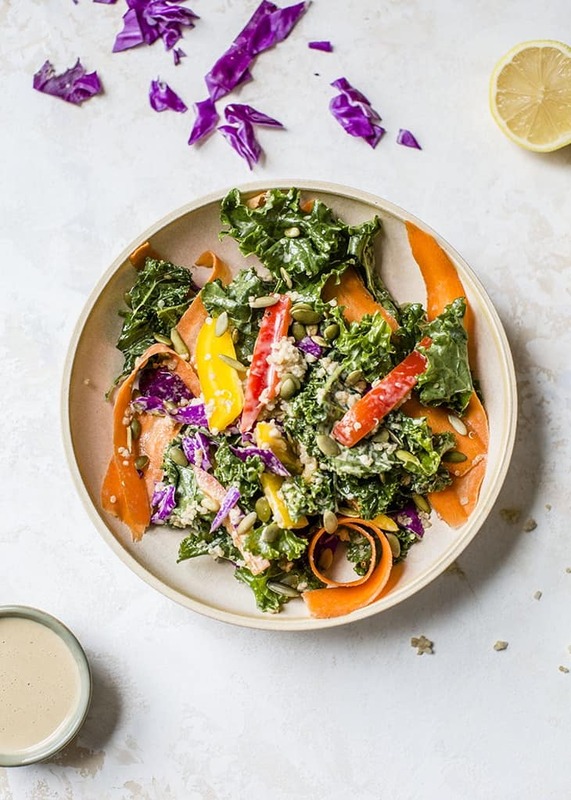 Make the dressing: In a small food processor or blender add all of the dressing ingredients, sunflower seed butter through salt, and blend until smooth. Adjust consistency with 1 tablespoon of water at a time. I used 3 tablespoons. Pour dressing over bowl and use tongs to coat salad with the dressing. Chill salad until ready to serve. Salad can be prepped a day or two in advance. I would cover salad bowl with lid, then toss with dressing just before serving. Store leftovers covered in fridge 4-5 days. See notes in blog post covering questions you may have about the recipe. Omit quinoa if completely grain-free or looking for a Whole30® compliant recipe. Wow! What a gorgeous salad…it is almost too pretty to eat. Love the bit about taking red cabbage to the beach…too funny! Pinned. This salad looks amazing! And I have totally been there when it comes to the body image thing. I got into strength training a few years ago and I love it because I can be more focused on getting stronger and healthier than looking a certain way. Love this salad! I had to stop myself from taste-testing the dressing too much. It’s mason jar salad week for me so I’ve kept the dressing separate and am putting it all together on a day-by-day. I used farro because hey, that’s what I had. And added a bit of tofu for more protein (which I guess makes it not paleo). A ‘cube of fresh ginger’ is kind of a subjective measurement but I’m a go big or go home girl when it comes to ginger so I got that covered. I also discovered that Trader Joes sells Organic Coconut Aminos. Thanks for the recipe! Hi Megan – Thanks so much for your comment and review of the salad! I am SO happy you enjoyed. I am a little obsessed with the dressing as well – glad you like it as much as I do 🙂 And you’re right about the cube of ginger, I’ll make a note about size 🙂 Thanks again for taking the time to stop by! Wow, your discussion genuinely hit home! Before going vegan, I still brought my own “healthy” snacks such as Quest bars, Greek yogurt cups, raw vegetables, egg white omelets, or even pieces of seafood or chicken because I was super obsessed with avoiding carbs and shoveling in as much protein as possible! I definitely was a thinner gal at that time, but I never, ever splurged on anything. If I did, I felt insanely guilty afterwards! Now I love eating more balanced meals that actually include carbs and healthy fats–I never realized how much I miss brown rice and pistachios! LOL!